Action-Packed Truth for the Youth! 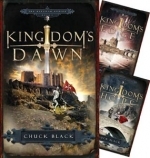 The Kingdom Series novels are Biblical allegories that are set in a medieval time period. They cover the span of time from Genesis through Revelation. They are full of action and adventure where swords, knights, and battles are all Biblically symbolic. The allegory teaches Godly character, the adventure captures the imagination of all ages, and the action keeps teenagers engrossed from cover to cover...even non-readers! They are GREAT read-alouds! Deep symbolism with an action story makes excellent reading for ages 8 to adult. FOR DETAILS ON EACH BOOK, VIEW EACH TITLE SEPARATELY. TO ORDER, SELECT INDIVIDUAL TITLES BELOW.